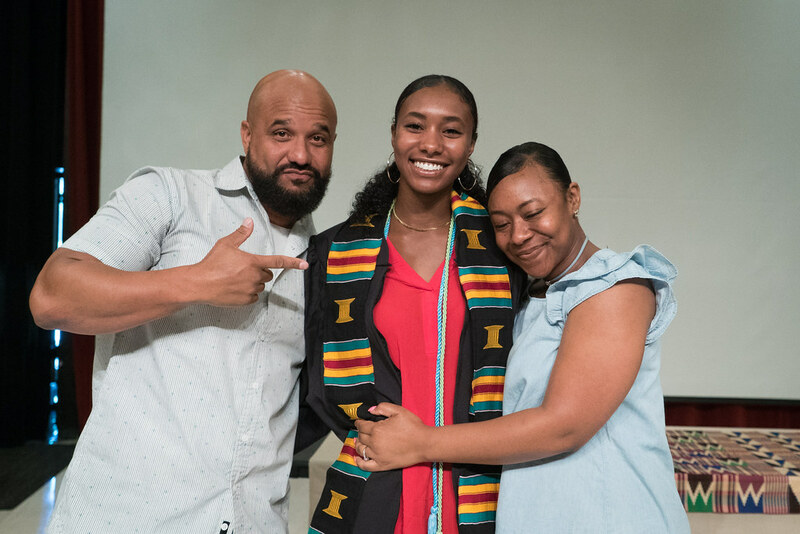 During the intimate ceremony, graduating seniors will be donned with a stole of kente, a fabric native to Ghana reserved for special occasions, and acts as a visual history for the wearer’s own cultural ethos. A rite of passage, rooted in African tradition, “in which seniors [of color] recognize loved ones or mentors who have been instrumental in their success” (Ross, 2009). Kimberley Gordy ‘06 “introduced The [Donning of the] Kente Cloth Ceremony to Goucher College and explains that “the essence of the ceremony is people sharing their stories. It holds a special meaning for Goucher community members of color because of our connection to African history and of the importance of looking back as you look forward” (Ross, 2009). The ceremony also presents the occasion for students to pay homage to those who have paved the way prior to and during their time at Goucher. Over the years, the ceremony has grown significantly to represent the collective unity of people of color (Black, Asian, Latinx, Native, First Nations, Middle Eastern, Multiracial/Biracial ) at Goucher College as a way to pay tribute to their own unique heritages, experiences, and achievements. Students with an international background may choose a graduation stole with the flag of one or two countries. Immediately following the Donning of the Kente, we welcome all our graduating seniors and guests to join us for a reception in Dorsey Courtyard and Rosenberg Gallery. If you are a graduating senior who is interested in participating in any of our Affinity Graduation Ceremonies, please register by Friday, April 5, 2019.